Margaret Pereira, always known as “Meg”, played a crucial role in the development of Bowls ACT. After serving for many years on various executives in her home state of NSW, Meg moved to the ACT in the 1990’s where she quickly involved herself in administration at her local club, Belconnen Bowling Club. 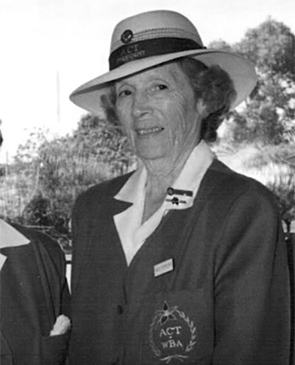 In 1998-99 she was elected President of the (then separate) ACT Women’s Bowls Association. She held this position for several years and then took on the role of Treasurer for a further couple of years. It was at this time that the Men’s and Women’s Associations commenced the process of unification. Meg was a member of the “Interim Executive” that oversaw this amalgamation a process that required the creation of a new Constitution to support the new legal entity. Throughout this process, Meg was able to apply her extensive personal skills to ensure that the interests of all parties were maintained- No Easy Feat! Meg was elected the first President of the unified, and newly names, “Bowls ACT Inc.”. She steered the new Association through those first few years where policy development was the main focus of attention. At the 2002 AGM, Meg stepped down from the Presidency and took up the position of Secretary, a position she held until her retirement in 2012. During her years on the Bowls ACT Executive, both as President and then Secretary, there was barely a day when Meg was not at her desk in the offices at Turner working for the good of the Sport. She was awarded Life membership of Bowls ACT in 2008.